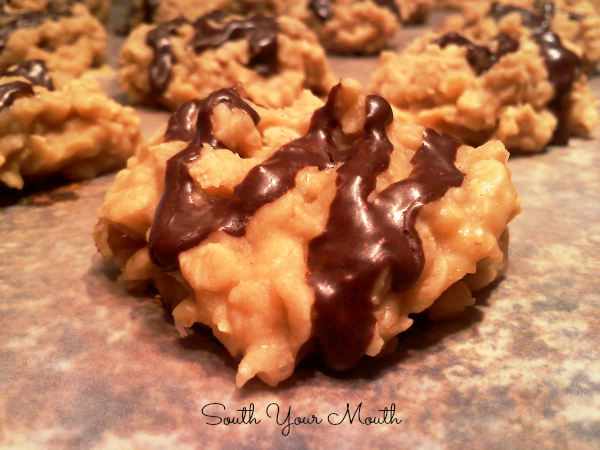 No-bake oatmeal cookies made with peanut butter topped with an easy cocoa drizzle. Brutus' favorite food in the whole wide world is a No-Bake Chocolate Oatmeal Cookie. When he sweetly asked me to make some for his school lunches I assured him that I would. That onion is so sweet I would have written him a check too if he'd asked me to. I popped into the kitchen to whip up a batch and realized that I was almost out of cocoa. Well... what to do? I thought I'd try them without the cocoa (making a few alterations to my recipe to account for that). I made them and they were really, really good. Score! Then I decided to use the rest of my cocoa to make a little chocolate drizzle! I can't wait for him to try one after supper! Combine sugar, salt, butter and milk in a saucepan then bring to a boil over medium heat, stirring frequently. Once boiling, cook mixture over medium heat for 1 full minute. Remove from heat immediately. Add peanut butter and vanilla then stir well. Add oatmeal then stir until thoroughly incorporated. On a sheet of waxed paper, drop mixture by the teaspoonfuls. Combine ingredients then mix well. Brilliant! I'm rarely without cocoa and always keep the ingredients for my favorite cookies on hand, but these look so good I think I'll try them "blonde" next time on purpose. Love the idea! These are wonderful! 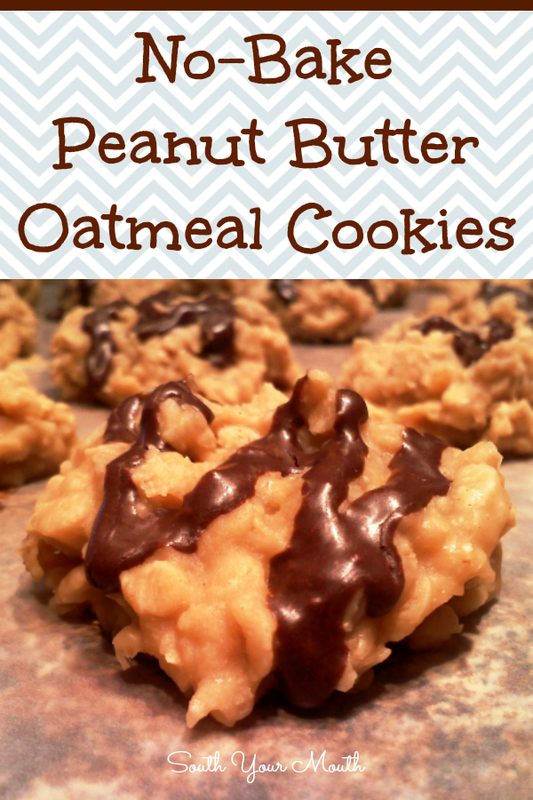 some of my favorite flavors all in a no-bake cookie= will be trying these w/the kiddos. They look mouth-watering!!! Truly favorite flavors all in one beautiful cookie. 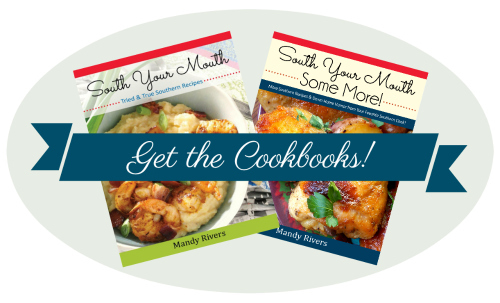 Thanks so much for linking up to Weekend Potluck! Just made these, they are cooling on the counter. I melted some milk chocolate chips and drizzled them on top since I don't have any powdered sugar. I hope they are good! They sure look and smell yummy. Don't know what kind of butter you used, but when I use tub butter they don't set up like with stick butter. Love 'em better that way though! I love no bakes! Thanks for bringing this to Weekend Potluck! Thanks, Tonya! I really appreciate y'all hosting those! Thank you so much for sharing this recipe. I do not like chocolate and the vast majority of recipes for sweet treats these days include chocolate and are difficult to modify to "chocolate free." This one will be easily convertible!!! I cannot wait to get home to make these!!! You're not the first person to tell me that so maybe I need to put some thought into more treats like these without the chocolate! Thanks for your comment! I seem to be late to this party, but I just made my first batch...oh.my.word!!!!! Amazing! Thanks! I'm not sure. Boiling the sugar creates the "glue" that holds this together and I'm not familiar enough with Splenda to know if it will yield the same results. If you try it, I'd love to know how it turns out! I just made these and I also placed in the refrigerator to help them firm up. I wasn't sure on the measurements for the chocolate drizzle so I will go without that this time. Has anyone tried eliminating the sugar and used honey as a substitute? What kind of oatmeal do you use? I like to marble them! Mix a generous spoonful of the hot mixture with a couple tablespoons cocoa, then partially stir back into the pot. Try it! Unbelievable!!! I made these exactly to your recipe and then poured chocolate chips in and at the end. They are still in the fridge cooling. But I have had a full spoonfuls to know that these are definitely a new favorite!! Well, Ima have to try that!! Thanks!!! Make these with cannabis butter makes good cuz the peanut butter flavors out the cannabis much better than coco...use Incas for pain/sleep sativa's for daytime pain relief an stress ...much more intense than smoking so be careful aan keep away from kids! I wonder how these would taste with Cookie Butter?! yum! made these to take to a quilting event. That is if they ever make it there! LOL! i have been making these for years and they are absolutely my fave. they taste just like peanut butter fudge! I love making these! So yummy. We've also made them with rice crispies, and/or cashews. Even yummier! I doubled this recipe, meaning I doubled all of the ingredients except for the vanilla extract. I added two tablespoons (yes 2 tablespoons) of pure Madagascar bourbon vanilla extract, and they were out of this world. Cooking one minute and using quick oats worked perfectly!